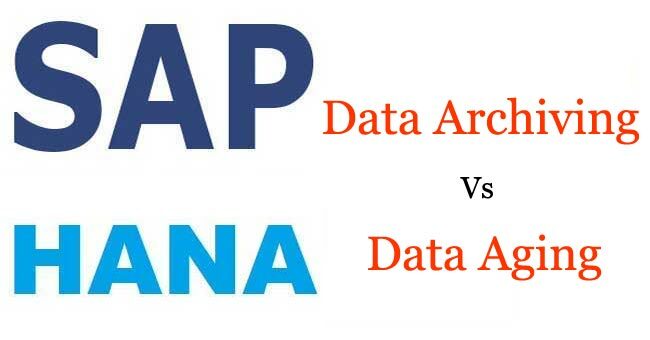 Data Aging is quite different as compared to Archiving because cold data is saved within the SAP HANA Database and is inaccessible via SQL in the same table as the hot data (yet in another partition). However the data which is archived is read-only - is printed to an archive file and then deleted from the database. This requires additional access paths which is the address information or archive indexes) meant to be read. Archiving is the foundation for ILM Aging targets and the primary memory footprint reduction which provides full coverage for the entire life cycle right up to point where all information is destroyed. Data Aging provides the proposes the option of shifting the less appropriate data operationally in a database, for gaining more working memory. The less pertinent SAP applications, mainly related to the data aging objects for moving data from the current area to the historical area. When data is accessed, the move effects the visibility. This also means that the performance queries of large amounts of data in current area in a shorter span of time. For fulfilling specific requirements related to the database and the application for applying data Aging to your data. Data Archiving is utilized for removing data from the database and then stored the same outside in a steady and protected manner. The archived data is preserved in a file system and from there can be shifted to other, which is certainly more cost-efficient and comes with a long-term storage system.